Seeking to stem the flow of migrants and asylum seekers across the central Mediterranean, European policymakers in 2017 struck a series of partnership agreements with North African countries. Led by Italy, European Union leaders have sought to cooperate with their counterparts to the South to manage this migration, offering financial support in exchange for stepped-up border patrols, the readmission of unauthorized migrants returned from Europe, and crackdowns on migrant smuggling in their territories. The European Union and its Member States have also directed hundreds of millions of euros to development and migrant and refugee protection projects in North Africa, including 116 million euros (US $138 million) to Libya from the Emergency Trust Fund for Africa. While these efforts have led to a marked drop in arrivals on European shores, they have come at a clear human cost. In Libya, the launch point for the majority of central Mediterranean journeys, increased patrols to intercept and return migrants, coupled with reduced onshore smuggling operations, have curtailed crossings to Europe but left many migrants and asylum seekers trapped in the country, unable to move onward. Tens of thousands are estimated to be held in detention centers in appalling conditions, often falling victim to abuse and exploitation. In November, CNN aired video footage of what appeared to be a migrant slave auction in Libya, in which two sub-Saharan African men were sold to the highest bidder. The video set off international protests, prompting France to call for an emergency meeting of the UN Security Council and pushing European and African policymakers to increase efforts to repatriate migrants and asylum seekers from Libyan detention centers. European cooperation with transit countries is nothing new. Spain and Morocco have built a deep working relationship on migration issues that dates back decades. 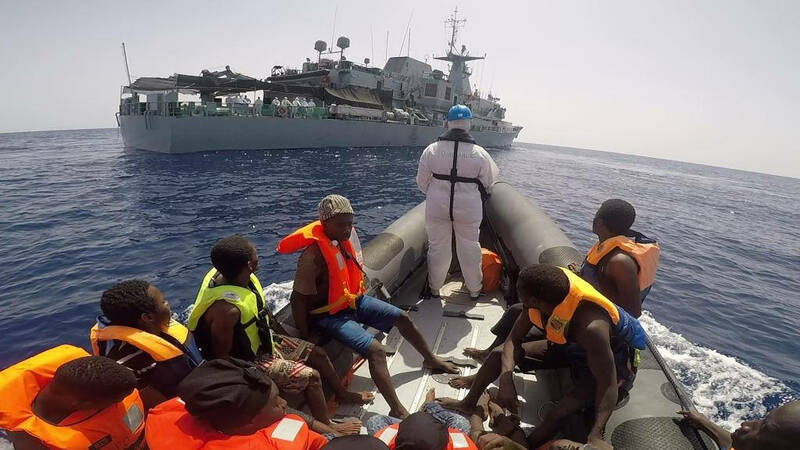 Meanwhile, European governments have supported and trained their counterparts in North Africa through regional operations, such as the Seahorse Mediterranean Network and Operation Sophia (the latter aiming to disrupt smuggling routes from Libya to Europe). Heartened by the apparent success of the March 2016 EU-Turkey deal in stemming migration from Turkey to Greece—which saw maritime arrivals via this route drop from roughly 57,100 in February 2016 to fewer than 3,700 two months later—European policymakers pursued deeper cooperation with North African countries to try and further reduce maritime migration to Europe. European policymakers redoubled these efforts in 2017, with Italy taking the lead. In February, Italy signed a memorandum of understanding (MOU) with Libya on border management, illegal immigration, human trafficking, and development. In this MOU, Italy promised to provide financial and technical support to Libya’s UN-backed Government of National Accord (GNA), including assistance for sea patrols, southern border reinforcements, migrant detention centers run by the Libyan Ministry of the Interior, and development projects along key migration routes. At an EU summit in Malta the day after the MOU was signed, European leaders endorsed this bilateral deal. Other governments have continued to pursue their own partnership agreements: In March, Germany signed a deal with Tunisia to facilitate the return of failed asylum seekers and provide 250 million euros (US $298 million) in development assistance to create jobs and offer training for young people, who might otherwise migrate. The German government also signed a deal with Egypt in August 2017 to jointly tackle illegal immigration and migrant smuggling, and to set up a center “for jobs, migration, and reintegration” in Egypt, which would help prospective and returning migrants find work. The same month, France held a mini-summit with the leaders of Germany, Italy, and Spain, as well as their counterparts from Chad, Libya, and Niger to coordinate efforts to reduce migration through Libya and across the Mediterranean. Since signing its deal with Libya, Italy has provided training and support for the Libyan Coast Guard, helping it to extend its operations to 80 miles off the coast—and, as a result, to intercept more migrants. Italy also sought to broker a peace deal with warring tribes that control routes into Libya, and it tightened control over search-and-rescue operations run by nongovernmental organizations (NGOs) in the Mediterranean, by requiring NGOs to sign a charter agreeing to work closely with Italian police and allow them to board boats. And crucially, in July Italy struck a deal with several militias in migrant-smuggling hubs such as Sabratha (on the coast, west of Tripoli) to curb their operations. Over the summer, crossings from Libya to Italy started to decline sharply. Between June and July 2017, sea arrivals halved from roughly 23,500 to about 11,500, and between July and October 2017, authorities recorded about 27,400 arrivals—less than one-third the number during the same period in 2016. Italy’s government credited this decrease to its cooperation with Libya. While cooperation with Libya has produced clear results in terms of reducing crossings, these efforts come at a profound human cost. The increased enforcement has created a bottleneck of migrants unable to leave. Between 700,000 and 1 million migrants remain in Libya, according to the International Organization for Migration (IOM). Migrants intercepted by Libyan Coast Guard vessels (or onshore, by local militias) are sent to government-run detention centers or informal centers run by militias or smugglers. Numerous government and NGO reports attest to the horrific conditions in these detention centers, documenting widespread torture, physical and sexual violence, and killings. And GNA support for militias in Sabratha to halt smuggling operations has sparked heavy fighting between rival militias, displacing thousands of people. In light of conditions on the ground, pledges to improve conditions for migrants seem deeply inadequate. Moreover, the short-term prospects for addressing the insecurity and lack of economic opportunities (and the draw of lucrative smuggling operations) that both drive and facilitate migration through Libya are slim. Torn apart by civil conflict since 2011, Libya lacks an effective central government. The GNA has limited territorial control outside Tripoli, with a rival government centered in eastern Libya, and militias and criminal actors run smuggling operations largely unchecked, especially in the southern part of the country. These shadowy elements have infiltrated Libya’s security forces, police, and government agencies, blurring the lines between state and non-state actors—and undermining Europe’s claims not to be dealing with militias. In focusing single-mindedly on stemming migration quickly, without taking comprehensive steps to address the instability at its root, European leaders are at best kicking the can down the road. In Libya, reaching a lasting peace deal that can restore effective governance is a critical first step toward building the institutions and security apparatus needed to manage migration effectively and humanely. Likewise, jumpstarting growth in the formal economy would provide genuine livelihood alternatives to smuggling operations. For now, Europe’s cooperation with Libya has slowed, rather than stopped, migration across the central Mediterranean. By essentially exporting some of its migration management activities to Libya, the European Union is relying on a complex web of state and nonstate actors to regulate such movements, while turning a blind eye to widespread human-rights abuses. Amid fighting between militias, arrivals ticked upward in October 2017, illustrating the fragility of this arrangement. Without effectively addressing the factors that drive and facilitate migration through North Africa, European governments have few good options. In the case of Libya, it can maintain the status quo, despite its clear human costs, with little leverage to challenge the terms Libya sets when negotiating its cooperation; or withdraw from the deal and precipitate a full resumption of dangerous journeys across the central Mediterranean. This raises the broader question: What price is Europe willing to pay to keep migrants from its shores? Deutsche Welle. 2017. New Tunisian-German Immigration Deal Trades Aid for Speedier Deportation. Deutsche Welle, March 3, 2017. Available online. ---. 2017. Managing Mixed Migration Flows in Libya through Expanding Protection Space and Supporting Local Socioeconomic Development (T05-EUTF-NOA-LY-03). Brussels: European Commission. Available online. European External Action Service (EEAS). 2017. EUBAM Libya Initial Mapping Report Executive Summary. Brussels: EEAS. Available online. Ford, Peter. 2017. Italy Sees Major Drop in Migrant Crossings from Libya to Europe. But Is the Cost Too High? Christian Science Monitor, September 8, 2017. Available online. International Crisis Group. 2017. How Libya’s Fezzan Became Europe’s New Border. Brussels: International Crisis Group. Available online. International Organization for Migration (IOM). 2017. UN Migration Agency Moves to Relieve Plight of Migrants Trapped in Libya, Backing AU-EU Plan. Press release, IOM, December 1, 2017. Available online. Kadlec, Amanda and Shelly Culbertson. 2017. Addressing Europe's Migrant Crisis Takes More Than Stopping the Boats from Libya. RAND Corporation, September 25, 2017. Available online. Libyan Government of National Accord and Italian Government. 2017. Memorandum of Understanding on Cooperation in the Fields of Development, the Fight against Illegal Immigration, Human Trafficking and Fuel Smuggling and on Reinforcing the Security of Borders between the State of Libya and the Italian Republic. Available online. Oxfam International. 2017. “You Aren’t Human Any More”: Migrants Expose the Harrowing Situation in Libya and the Impact of European Policies. Oxfam International, August 9, 2017. Available online. Rankin, Jennifer. 2017. EU “Running out of Money” to Stop Migrants Travelling from Africa. The Guardian, October 20, 2017. Available online. Reuters. 2017. German Foreign Min Cites Torture, Executions in Libyan Migrant Camps: Report. Reuters, January 28, 2017. Available online. ---. 2017. Germany and Egypt Agree Deal to Stem Migrant Flow. Reuters, August 28, 2017. Available online. Semprini, Francesco and Jacob Svendsen. 2017. Libyan Path to Europe Turns into Dead End for Desperate Migrants. The Guardian, October 30, 2017. Available online. United Nations High Commissioner for Refugees (UNHCR). 2017. The Mediterranean Situation: Italy. Accessed December 1, 2017. Available online. Walsh, Declan and Jason Horowitz. 2017. Italy, Going It Alone, Stalls the Flow of Migrants. But at What Cost? New York Times, September 17, 2017. Available online. Wintour, Patrick and Kim Willsher. 2017. African and European Leaders Agree Action Plan on Migration Crisis. The Guardian, August 28, 2017. Available online. Which developments emerged as the world's top migration issues of 2017? MPI policy analysts assess the top trends, policy shifts, and other happenings of the year in this annual compilation of articles.